Bad Marketing Combo: Milk and Tacos! There are some products that seem like they're made to go together: peanut butter can be sold alongside jelly, cream cheese with bagels, beer and burgers. And yet, this would seem to be a very difficult thing to analyze, or determine in theory rather than in practice. It's a gut-feeling thing (literally): you probably just know it when you see it, but you definitely know it when you taste it. 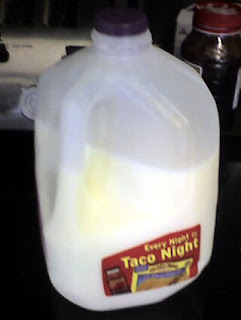 And you know it when you really, truly don't: ladies and gentlemen, I present the gallon jug of milk on which is advertised tacos. Monday mornings are hard enough on their own, but when I'm assaulted with a combination of this gastronomic blasphemy when I'm just trying to prepare my coffee... well, it's too much. Can a user's experience and satisfaction with a product really be tainted by these kinds of purely psychological, imposed associations? It's a subject for debate - but my stomach (ugh) says yes.